According to the 390-pages atlas released by the United Nations Environment Program (UNEP), Africa is changing rapidly because of many factors like deforestation and climate change. The already fragile environments are under pressure due to wars, the increasing population and water scarcity, a major problem as 300 million people suffer from it. Africa’s rapidly changing environmental landscape, from the disappearance of glaciers in Uganda’s Rwenzori Mountains to the loss of Cape Town’s unique “fynbos” vegetation, is presented today to the African Ministerial Conference on the Environment(AMCEN). The Atlas, compiled on behalf of the ministers by the UN Environment Programme(UNEP), underlines how development choices, population growth, climate change and, in some cases, conflicts are shaping and impacting the natural and nature-based assets of the region. Africa: Atlas of Our Changing Environment features over 300 satellite images taken in every country in Africa in over 100 locations. The ‘before’ and ‘after’ photographs, some of which span a 35-year period, offer striking snapshots of local environmental transformation across the continent. –Disappearing glaciers in Uganda’s Rwenzori Mountains, which decreased by 50 per cent between 1987 and 2003. (…) The Atlas, compiled in cooperation with researchers and organizations in Africa and elsewhere, offers a sobering assessment of thirty-six years of environmental change, including:“The swell of grey-coloured cities over a once-green countryside; protected areas shrinking as farms encroach upon their boundaries; the tracks of road networks through forests; pollutants that drift over borders of neighboring countries; the erosion of deltas; refugee settlements scattered across the continent causing further pressure on the environment; and shrinking mountain glaciers”. (…) Between 1990 and 2004, many African countries achieved some small but promising environmental improvements, mainly in the field of water and sanitation, according to the Atlas. A few countries have expanded protected areas, currently numbering over 3,000 across the continent. However, loss of forest is a major concern in 35 countries, including the Democratic Republic of the Congo, Malawi, Nigeria and Rwanda, among others. This is closely followed by biodiversity loss?which is occurring in 34 countries such as Angola, Ethiopia, Gabon and Mali. Land degradation, similarly, is a major worry for 32 countries in Africa including Cameroon, Eritrea and Ghana. Other problems include desertification?in Burkina Faso, Chad, Kenya and Niger among others?as well as water stress, rising pollution and coping with rapid urbanization. Africa is losing more than four million hectares of forest every year, twice the world’s average deforestation rate, says the Atlas. Meanwhile, some areas across the continent are said to be losing over 50 metric tonnes of soil per hectare per year. The Atlas also shows that erosion and chemical and physical damage have degraded about 65 per cent of the continent’s farmlands. In addition, slash and burn agriculture, coupled with the high occurrence of lightning across Africa, is thought to be responsible for wild fires. Although Africa produces only four per cent of the world’s total carbon dioxide emissions, its inhabitants are poised to suffer disproportionately from the consequences of global climate change. Africa’s capacity to adapt to climate change is relatively low, with projected costs estimated to reach at least 5-10 per cent of GDP. 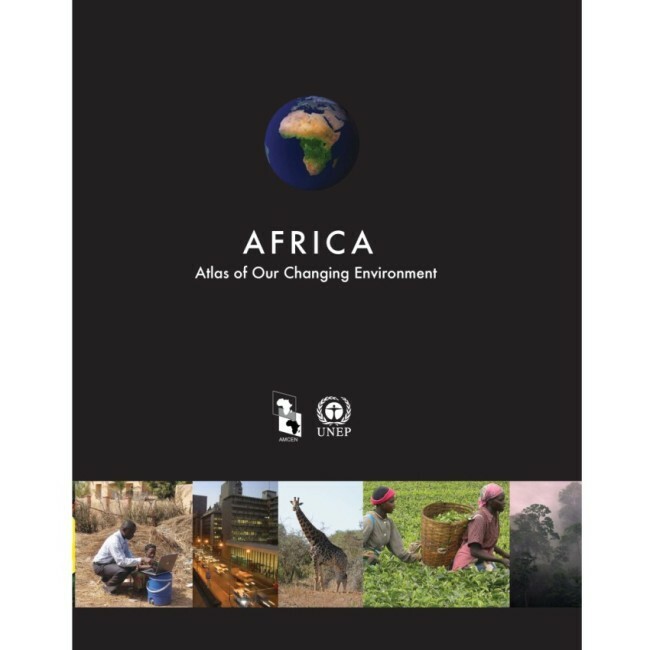 (…) Africa: Atlas of Our Changing Environment contains 316 satellite images taken in 104 locations in every country in Africa, along with 151 maps and 319 ground photographs and a series of graphs illustrating the environmental challenges faced by the continent. All the materials in the Atlas are non-copyrighted and available for free use. Douala, je vous réponds en Français comme nous sommes tous les deux francophones. De rien, ca me plait d’écrire des articles sur l’Afrique quand je trouve des informations intéressantes. J’attends avec impatience votre commentaire approfondi. En effet, il est toujours intéressant d’avoir des informations provenant de gens sur place.